Most members of the Class of Sc’82 have never visited The Tea Room – a student-run, environmentally friendly coffee shop that opened in 2006. 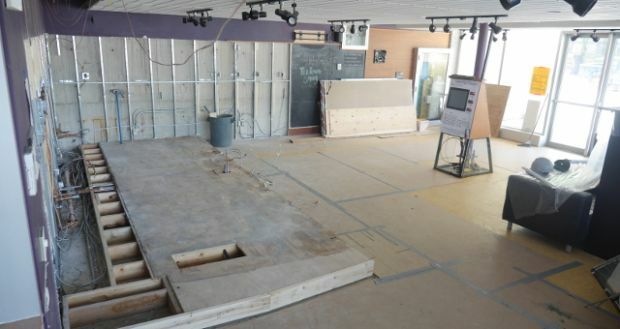 So it might come as a surprise that members of Sc’82 are making a class gift of $70,000 to renovate the cafe in Beamish-Munro Hall. Why did Sc’82 alumni make a major donation to a cafe many of them have not visited? Class President Don MacDiarmid says the gift is about engineering alumni supporting engineering students. “If The Tea Room is important to students, it is important to my classmates,” says Mr. MacDiarmid. Sc'82 has established two funds to support current engineering students. One is an endowment for student awards, while the other supports special projects to enhance the undergraduate education of engineering students. The class decided to support The Tea Room after a recommendation from the Dean of Engineering’s office and a presentation from The Tea Room staff. 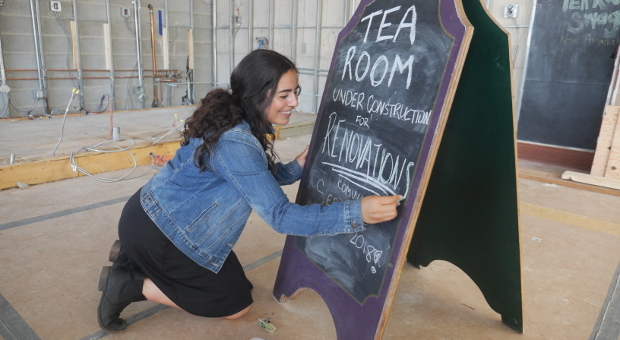 The Tea Room Head Manager Isabel Hazan, Sc'20, updates the sign. 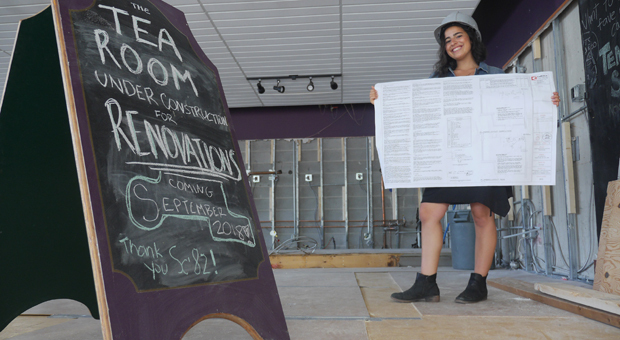 Isabel Hazan holds up drafted plans for The Tea Room renovations. Sc’82 Reunion Co-ordinator Cathy Ella was on the Engineering Society Board of Directors from 2002 to 2008. She remembers The Tea Room founder Michele Romanow, Sc'07, MBA'08, (who now stars on the hit CBC TV show Dragons’ Den) pitching The Tea Room and the board supporting the venture. “The Tea Room is a great student enterprise and Sc’82 is very pleased to contribute to its success,” says Ms. Ella. The Tea Room is a socially conscious cafe that proves you can make money and be environmentally friendly. All of The Tea Room’s products and packaging are 100 per cent compostable and the company plants trees to offset its carbon footprint, achieving carbon neutral status in 2015. It was the first zero-consumer-waste-certified cafe in North America, according to The Tea Room Head Manager Isabel Hazan, Sc’20. “The Tea Room is a great student enterprise and Sc’82 is very pleased to contribute to its success." The cafe is entirely run by students, with the five managers and 55 staff comprised of students from all faculties – providing financial support to students during the school year. The Sc’82 donation will be used to allow The Tea Room to serve more customers by adding an extra cashier station and relocating the side bar to divert the traffic away from the entrance. The renovations will also improve the flow of operations behind the bar, making service more efficient and consistent. 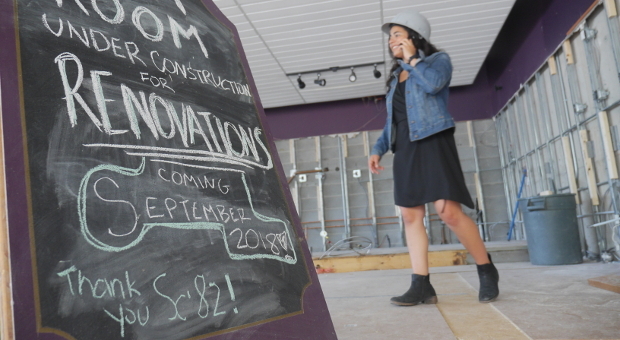 With the design changes implemented, the business will be able to keep up with its increasing popularity on campus and The Tea Room’s mission can reach more students at Queen’s. Donations can be made to the various Sc’82 funds through the Give To Queen’s website.